THE EVENT is a dEceptively simple piece of theatre, which playfully but profoundly leads us to question not only the nature of reality, but the very nature of existence itself. A man standing in a pool of light wittily deconstructs the theatrical experience while offering parallel insight into modern life. What if everything we believe and experience is an illusion-a fantasy designed to make us forget all that's important and... we do. American David Calvitto performs John Clancy's monologue with aplomb. If a review could be written with just one word then this would be the one to describe The Event. Take a moment to soak in the true meaning of the word 'profound'. Let it resonate in the mind for a while. Meditate on the meaning of the word 'profound'. Perhaps profound thoughts will follow. Maybe the truth of the universe will begin to echo in ensuing contemplation. For this is the effect of The Event. It is a one-man show that starts simply enough with short, sharp, punchy lines. Actor David Calvitto delivers his lines with charm, self-deprecating humour and finesse, enchanting his audience and outlining truisms about the theatre. Theatre initially is 'The Event'. Thus theatre in all of its forms is cleverly and humorously dissected leaving no stone unturned - actors, directors, technicians, audiences and reviewers all take a bow in Calvitto's repertoire, directed and penned by John Clancy. The humour is wry, the script witty and the delivery simple and effective. But it is deceptive. Herein lies the rub. This brilliantly, and cunningly crafted, play takes a twist. Before long it is apparent that the theatre of life has become 'The Event' and then another twist as insightful and universal truths are revealed. Theatre and philosophy combine to produce a brilliant and thought provoking hour. The words and thoughts provoked linger long after the final bow in a refreshing manner. Stop me if you've heard this one before. No, really. Stop me, or doze off, or walk out. You may think you know what to expect, but you'll be surprised. The Event is a play about a play. A deconstruction of the theatre experience. An actor's equivalent of a magician revealing how the tricks are done. Each word, gesture and lighting effect is dissected and examined in exquisite detail, held out for scrutiny and the audience's acceptance or rejection. There is one man on stage and, later, a chair. The man plays his part, speaking the words he has previously rehearsed, while a stagehand and a lighting technician do precisely the jobs they were contracted to do. We strangers (the audience) sit quietly in the dark and fulfil our obligations as observers of the event, but are we actually part of the performance? Playwright John Clancy won a Fringe First award for The Event in Edinburgh last year, and it's easy to see why. He has collaborated with New York actor David Calvitto on a number of occasions, and it's been a multi-award-winning partnership. Calvitto's compelling performance is a perfect match for the intricate, challenging text. This play about nothing and everything in the world covers the universe in an hour. Assumptions are quickly made and just as quickly discarded. Real versus staged - can we tell the difference? The actor's 'relationship with the truth is suspect, and highly charged' but what about our own performance? Are we living a life, or merely going through the motions? In a world that continually offers new ways to keep in touch, are we really moving further and further away from each other? For this year's Fringe, Guy Masterson's Centre for International Theatre brings eight shows to Adelaide on a mission to include more drama in a festival which now seems top-heavy with comedians, burlesque and circus-style acts. All Masterson's offerings are based at Higher Ground, and after The Event you might be tempted to see the lot. An actor, a technician, a stage hand and a performance space, that's all that is required for an event, isn't it? Well a really good script does help. This event definitely has that. It is strange to sit and listen to a man talking about a man, himself, taking part in an event, this performance and it certainly leads to a contemplation of reality and our perceptions of it. This production will not be everyone's cup of tea, but if you have any association with theatre, it will speak to you. If you have an appreciation of words and the way they can be used to build from nothing, this performance will fascinate you; and if you enjoy good acting, this is definitely for you. Matthew wrote: A nameless actor narrates the unfolding Event in which he is performing - explaining the conventions that shape the relationship between him, the audience and the writer whose words he speaks. The shattering of these preconceptions leads to innumerable laughs - even an apology for just how 'meta' the Event is - but, at the same time, the Event is a metaphor for the fragile conventions of the society in which we live and the meaninglessness of our daily lives. Listen to the man in the light. Jimbo wrote: Totally engaging, humourous and thought provoking performance. Calvitto is charming. CaptainCat wrote: Supreme. Perfect Fringe Fare! ILive4Cheese wrote: I have to say I was a tiny bit underwhelmed leaving the theatre, but then I haven't been able to get this show out of my head! Calvitto's delivery is superb, Clancy's script seems to intuit every response you'll have an audience member - why do we do this to ourselves! Only downer is the very uncomfortably backed chairs - but he's probably aware of that too. angela wrote: This monologue on acting, theatre and individuality might be absurdly self referential but it's witty, intelligent, touching and beautifully performed. Calvitto combines those great actorly traits, an engaging personality that draws you in and a capacity to suggest great depth. He was great. This was so clever. Cos wrote: I was taken with the power of this playwright as well as the actor who performed it. It had many layers from an expose of the theatrical form to a challenge for modernity to find better ways to communicate with each other. I loved it. Fringer wrote: David's performance is meticulous, polished and professional. Clancy's script is a curious melange. It begins with an assertion that Western theatre is a self-indulgent, middle-class, leisure pursuit. I think Brecht and Havel would disagree. A large chunk of the play is a longwinded, cynical, Luddite rant, reminiscent of a fundamentalist preacher in full flight, against modern communication technology arguing that it has broken down communication. Great acting - odd script.5 stars for the acting. Kay_Today wrote: The script is clever, funny, thought provoking and surprising. Added to this was great acting to give us a memorable 'event'. AmieK wrote: If you've ever been in a play, seen a play or reviewed a play, this show is a must see. David Calvitto engages his audience for the full length of his production, which tells a tail about one mans views on everything theatrical. The show will leave you wondering just how real theatre really is, and exactly what are performers really thinking when they stand on stage. edam_ wrote: David Calvitto delivers a virtuoso performance in this more-than-stylish monologue deconstructing first the essence of theatre, then bursting its bounds to confront fundamental questions of our role on the cosmic stage of human existence. A remarkable and inspiring piece which appears to be about nothing but transpires to be about everything, by turns ironic, wistful, world-weary, playful and authentically hopeful. Style and substance knit together a tapestry of fascination and enchantment. 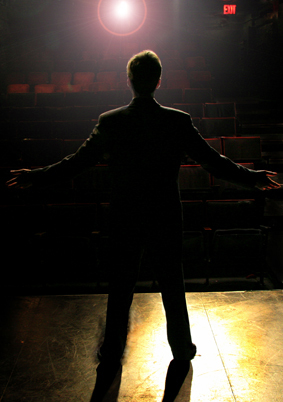 Glen_Christie wrote: The one-man show can be a burden - for the performer and for the audience. The Event, however, engages, captivates, invokes thought and engages everyone - even the crew. David Calvitto moves through this unconventional approach to theatrical convention with the ingrained knowledge of the seasoned professional. His performance - if, indeed, it is such - is timed to perfection and he holds the audience in the palm of his hand. See this and This Is A Play - by theater simple. Perfect bookends. matteo_son wrote: a nice 'anti-play' the script and performance are perfect, so much style! David Calvitto is at such ease in his role and sleaks thru the script breaking down life and the theatre anybody with a brain still intact would see this show. montyec wrote: A great night for those who have seen too many personally indulgent one man shows- this is the anti-one man show. It turns the genre inside out, shows you how the trick of theater is done and also makes you think. A great performance and a very clever script. littlebrother wrote: the audience gave David Calvitto a curtain call last night. it was a terrific performance. what a play! KateFraser wrote: Calvitto is brilliant as The Man, his sparkly eyes and intelligent performance hold The Audience's attention from beginning to end. I have no doubt I was not the only person in the room wanting to respond aloud to him on more than one occasion, but the conventions of theatre made me hold my tongue. Clever, multi-layered, thought provoking and thoroughly enjoyable. Don't miss out. heller wrote: this was exceptional. very funny and thought provoking. tankililla_ wrote: this piece of theatre is a unique bit of genius and is a definite 10 out of 10. go and see it you won't regret it! Vinylcutter wrote: This was a witty, perceptive play about staging an event and about us, the audience, but it moves into many layers of our lives. Calvitto is the consummate performer - warm, intelligent and very engaging. He smartly handles a clever, thought provoking script which challenges and sometimes confirms our preconceptions about nearly everything! Very funny too! I laughed out loud, nodded my agreement and I am, days later still mulling it over. FABULOUS!! SEE IT! Madame_P wrote: This show is a real brain twister in the best possible way. And it is such a good experience. What is real, what isn't? I can't really describe the Event. You will just have to see it. The actor reflects us as individuals and society as a whole. A superb performance. Do not miss it. Mia wrote: A peculiar but delightful deconstruction of what a theatrical performance actually is. Presented entirely in third-person narrative, this show is both deftly humorous and cognitively challenging. With many observations that will ring very true for anyone with experience in the theatre, whether as a performer or patron, it also delves into a more philosophical examination of the Main Event; life. The structure of the show is refreshing, the content at once thought provoking and funny. CaptainCat wrote: If you love theatre as I do, this is the perfect deconstruction! The brilliant Calvitto - who I vaguely remember from 12 Angry Men some years ago - is both charming and caustic as he deftly dissects the theatrical experience for us. It is a simple concept but exceptionally cleverly done. He almost uncannily reads our thoughts as he tells US what we are thinking - and he is right! Very VERY clever! Superbly executed. Excellent Theatre. Totally recommended! "The man stands in a pool of light on the stage. He is an actor. We know this because he tells us so, but also because our past experience tells us that this is what actors do. He appears to be intelligent, but that might just be clever direction. There is a huge gap between what we assume and what we actually know. The more he tells us, the less we think for ourselves. We are truly in the dark. The first few minutes of John Clancy's intelligent and exhilarating monologue, performed with a conjurer's elan by David Calvitto, appear to be a facetious exercise in meta-theatre. Calvitto stands on stage and deconstructs everything he is doing the entire theatre-going experience. It's funny and cute, but just when you think you've got the joke, the monologue lurches into darker, more invigorating territory, and you start to realise that the show is deadly serious. Generally speaking, we go to a play, the lights dim and the actors try very hard to make us suspend our disbelief. In the theatre, we all believe in fairies and Tinkerbell never dies. But what if we haven't realised that we are permanently sitting in a darkened theatre, and everything we believe and experience in our lives is an illusion, a cunning fantasy designed to make us forget all the important things and create a kind of collective amnesia? "...there are some [one-person plays] in which a single performer is gifted enough to rivet an audience. Such is the case with The Event, in which a cool, sharp American called David Calvitto appears as someone who is and isn't himself. He is, because the play's narrator is an American actor who begins by talking about the oddities of performing night after night to audiences of sometimes sleepy, sometimes eager, always unreadable strangers. "Plays about theatre are invariably tediously indulgent in-jokes to amuse the producer's peers. John Clancy's The Event, however, is a far cleverer affair, in which Clancy's regular collaborator David Calvitto steps into the spotlight and leads us through a witty and incisive dissection of the performance process. Through this, we also get a consciously existentialist study of the human condition in all its absurdity, as well as a nod beyond the fourth wall at the big bad world outside. In the piece's direct address to the audience, The Event resembles a less confrontational take on Peter Handke's counter-cultural piece, Offending The Audience. In Clancy and Calvitto's hands, though, it becomes a laconic but wise plea for flesh and blood communication. Aside from The Event's broader philosophical musings about truth, artifice and the unspoken contract between audience and actor, it's worth it just to see what is effectively a Calvitto masterclass. THE SCOTSMAN - FRINGE FIRST AWARD WINNER 2009 "New York and Edinburgh Fringe star John Clancy responds to troubled times with an extraordinary tour-de-force in the shape of The Event, a one-hour solo show about theatre, performed by Clancy's old friend and collaborator David Calvitto, that transcends and transforms this most irritating of genres in at least two ways. First, its observations on theatre itself are so lethally accurate and funny that it's difficult to resist them - Clancy sees his chosen art form steadily, and sees it whole, as it flickers away in a curious corner of our vast electronic entertainment culture. But secondly, within ten minutes of the show's start, Clancy has begun the task of transforming his lone actor in the spotlight into a haunting everyman hero for our times; a man unsure of his own authenticity, haunted by the ageing muscular memory of a time when phones had to be dialed and typewriter keys struck with force, and bewildered and "unmoored" by the collapse of the grand narratives of hope and progress that once used to sustain his performance. "It's not very often that a deceptively simple piece of theatre can make you question, not only the nature of reality, but the very nature of existence itself. But this is what The Event does. It's ok, they don't hand out LSD on the door; The Event is a single-hander performed by David Calvitto. Standing alone in a pool of light, he begins to deconstruct the artifice of theatre wittily, amusingly and yet profoundly. It is quietly shocking and yet very funny. Are we all alone on our own private stages? Is there anything out there in the darkness? Are we who we say we are or are we just pretending? All these questions are raised. While all this might sound like some high-brow exercise in philosophy, it is far from inaccessible; indeed, it unfolds effortlessly, taking us away from our usual standpoint and from our usual mindset. David Calvitto, as the actor of The Event, engages from the first to last. We want to like him but he constantly reminds us he is but a creation and not the real man. It is quite the tour-de-force. This is classic fringe production. Simple, beautifully scripted and masterfully delivering a profound, thought-provoking and highly unusual piece of drama in an intimate, and thankfully, cool venue.